Thoughtfully designed kitchens feel more like a custom home with granite or quartz counter-tops, open kitchen plan with islands, GE Stainless Steel side-by-side, Energy Star rated appliance package, Designer painted cabinets with glass tile back-splash, LED lighting package, under mount sinks, pendant lighting and USB charging stations complete your kitchen. Great for entertaining, the living areas are open concept with ceiling fans and wood plank flooring throughout adding a touch of elegance. Premium units will offer an upgraded audio package, Quartz counter-tops and most will have heightened ceilings of 10-12 ft. Private yards are located in most buildings. Enjoy our luxurious pool with outdoor lounge areas, pet park, a clubhouse with pool table, TV lounge and Starbucks coffee bar. 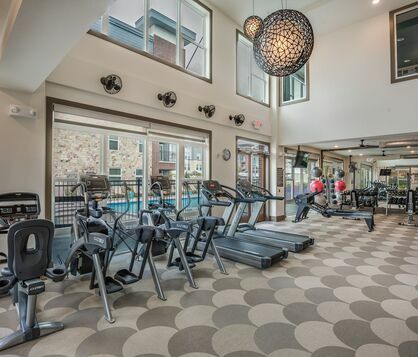 Enjoy our state of the art fitness center complete with Peloton bikes, free weights and a yoga space, which are available 24/7 for your convenience. A business center with PC/Mac, Wi-Fi in all the common areas and a billiards/gaming area are available for you to enjoy at your leisure! The Enclave at Woodland Lakes is conveniently located off of FM 1488 approximately 2 miles west of I45. 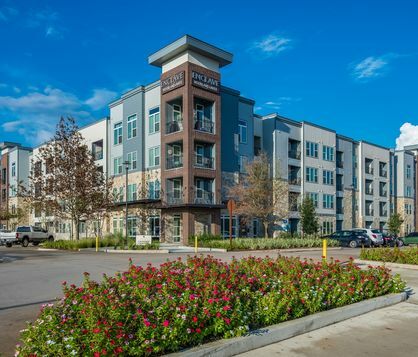 Golfing enthusiasts will enjoy PGA courses nearby and The Woodlands Mall just minutes away is where you will find fine dining, elegant and unique shopping and plenty of other activities! Welcome Home! See what makes Enclave at Woodland Lakes exceptional! We look forward to sharing our community with you!